Most of the hockey world is aware that Capitals top-line right wing Tom Wilson was recently suspended for 20 games due to a hit on the St. Blues’ Oskar Sundqvist. Controversy over the hit and suspension aside, this is a huge blow to a team coming off its first Stanley Cup title. How will losing Wilson negatively impact this team? Sadly, in more ways than one might think. Although Wilson isn’t known for extremely high offensive totals, he was starting to fine-tune his skill and many were excited to see what he would do this year after recording a career-high 35 points. Wilson doubled the number of goals he scored last year (14 compared to seven in 2016-17). If someone doesn’t step-up in his place, fans will see the team suffer without their power forward on the top-line. Points aside, Wilson brings something to the team that is simply invaluable. It isn’t shown on the stat sheet, and it’s not something one can teach. He was born with grit and aggression that quite simply, scares others when he’s on the ice. Take the Capitals’ home opener for example; Boston Bruins forward Brad Marchand would have never attacked Eller if he knew Wilson was playing that evening. Plain and simple. Mind games are a large part of any sport and instilling fear in one’s opponent is a key part of the game that many seem to forget. When Wilson is skating toward another player, regardless of if he makes contact or not, he’s intimidated them. 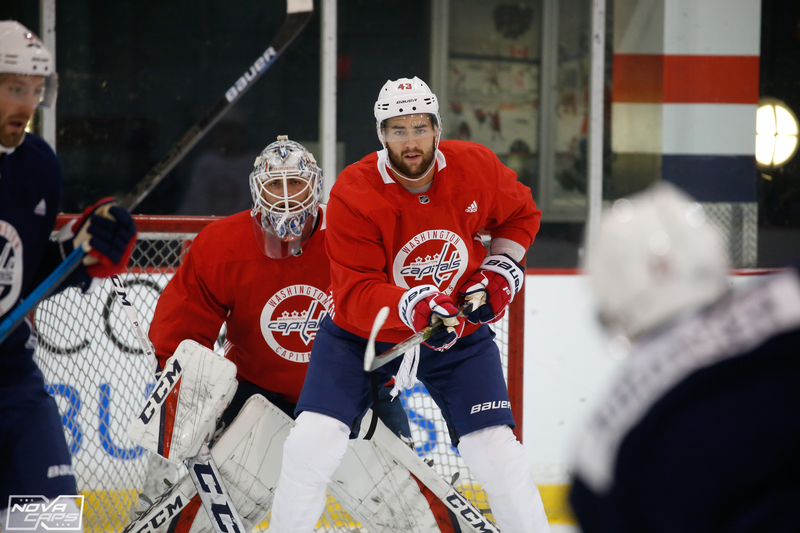 When Tom Wilson entered the league many people thought he was just another “goon”, but those who follow the sport closely knew that there was skill there. Each season fans have seen many positive changes in him as a player. He’s became a force to be reckoned with and can hang with some of the best in the league. The Capitals will still maintain a high standing in the Metropolitan Division. However, Wilson is truly is a one of a kind player and for the Caps, losing him for nearly a quarter of the season is devastating. This entry was posted in News, NHL, Players, Washington Capitals and tagged Boston Bruins, NHL, Nicole, Nicole Giordano, Suspension, Tom Wilson. Bookmark the permalink. I just want Tom to be smarter about how he hits players–and when. Tim Horton, Brad Park, John Ferguson, Orland Kurtenbach, Bobby Orr, Brendan Shanahan, Rob Blake, Wayne Cashman, Gary Roberts, BamBam Cam, Al Secord, Rick Tocchet, John LeClair, Jarome Iginla and Mark Messier, among others, used to DESTROY other players in the corners and along the boards without getting a rep around the NHL for being risque or dirty. Tom Wilson can do (and has done) the same indispensable trench work for us as the afore-mentioned tough guys did for their teams. But I don’t want him flirting with disaster to do it.